* It is hard to understand why Lodge should think this, since American Express was founded in New York in 1850 and had its headquarters in Manhattan. Bright intervals, wind still E. Footner came to lunch. Pay for Jan. this has been reduced to 767 ps. 25 paras. Went to the bazaar with Thomas: saw a carpet price 30 Liras. I think the owner will come down : am to see nine carpets next Sat. * Major F.C. Lodge (Norfolk regiment married Norah Margaret Bryans at Bellary, India on this date in 1913. They have put [? 9 men] more into our house: this makes it uncomfortably crowded & we have to give up our mess room and have meals in the laundry. Why they will make us as uncomfortable as they can I don’t know. Went into the bazaar & bought an oke of pecnicsh* for 70 ps. * There isn’t any reference to this commodity in English, Anglo-Indian, or Turkish. Fine & mild. Had tea with Comdr. Fabre. Heard that Ukrania* had made peace. Two of our latest arrivals, Stewart & Brook, both youngsters, were taken to hospital suffering from typhus. * Ukraine, at the time in conflict with the Russian Bolsheviks following the revolution of October 1917, made a separate peace with the Central Powers on 9 February, 1918 during the discussions at Brest-Litovsk. The last few days have been very cold, wind from the north. It is miserable in the house as one has nowhere to go for warmth. We dine in greatcoats. Ground covered with snow – still snowing. 71 to M. Letter to Father. Bright day with warm sun. We have been here 4 months today. Bright and warm in the sun, hard frost during the night. P.Card 103 d 18th Dec: & letter 106 d/ 30th Dec: from M.
Letter d/ 18th Dec: from Evelyn. Bought a rug in the bazaar for 14 liras: my room now looks more comfortable now. Nice warm day. Both days dull & cold. Rec’d 7 liras Emby. Money Sunday [17th]. Admiral Kirkoff* (Russian) came to tea with Lethbridge, a very nice man. * Kirkoff, nor any reasonable permutation of the name, does not appear on the list of flag officers of the Imperial Russian Navy 1914-1918. Dull & cold. Wrote 74 to M. Ethel. Robert Berry. A large flight of storks came over this morning from the South. Lovely fine day. Went down to football after lunch, on our return we heard that we leave for Broussa [Brusa, Bursa] at 2 am., rather quick work. Was packed and ready by 1.30 pm. Letter 75 to M. saying I was leaving for Broussa. Left our house 1 am,, picked up Davie & Broke Smith at No. 2 camp. We were put into two 3rd. Cls. compartments, 5 to each, very hard and narrow seats where we spent the night. The Comdt. who has been summoned to Stambul accompanied us. Left Afion [by train] 12.20 pm. & arrived Eski-Cheir [Eskişehir] 8.20 pm. Had food in the same old restaurant [Lodge had been at Eski-Cheir on 31st October, 1917 on his journey from Yozgad via Angors [Ankara]. Spent another night in our hard seated carriage, though we asked the Comdt. to allow us to sleep in the waiting room, he would not do so, saying that we were leaving at 2 am. Glad when dawn came. Saw a man lying on platform evidently dying. It turned out that he had been looting carriages and had been practically kicked to death by Germans, a somewhat drastic proceeding. He died. Had an excellent breakfast at the old Bavarian woman’s shop. Left Eski-Cheir 12.30 pm. arrived Biledjik [Bilecik] at 6.10 pm. Hence we hung about until 9 pm. when we got into 4 aribas and drove uphill for about an hour to the village and put up at a khan, fairly clean. Our Comdt left without saying good bye to anybody, a thoroughly gentlemanly thing to do. Slept well, not troubled by bugs. Spent a quiet day: took a stroll after tea. Wet day. Left in 9 aribas about 9.45 am. Lethbridge & I had 6 in ours including most of our kit, it was horribly crowded: we got rid of one after first halt. Still raining. Arrived Yenishir [Yenişehir] before dusk and put up at a khan, fairly clean, though we had been warned not to use the beds. Had food at an eating house kept by a Maltese. Slept badly owing to a stuffy cold and a bad head. Lovely morning. left at 9 am. – only 4 in our ariba, including driver. So we were very comfortable. Excellent road, best seen in Turkey, and almost level for the greater part of the way. Mount Olimpus* on our left hand, covered with snow, we skirted it during the journey. Much warmer here, almond and may trees in full blossom. A slight rise, and then a long descent into the Broussa valley. Arrived at our house about 5 pm., and American Girl school. I’ve got a splendid view to the N.E. from my room, which I share with Julius. A number of Muhamedan Ind: [Indian] officers live in next house. Slept on verandah. * Lodge may be mistaken. Aside from the Mount Olympus in Greece, there is another in mountain named Olympos in Turkey, but located in south-western Anatolia. Spent day getting things unpacked & may bed up. Went into the bazaar at 10 am with Thomas. On our way back called at house where the Genls. live. Saw Delamain, Greer, Wilso, Chitty, Annersley, Parr, Hibbert, all very well. NB Brusa was regarded as the best place of captivity in Turkey (apart from Istanbul, where General Townshend was held), and was occupied mostly by senior officers. Wrote 76 to M also letter to Mother. Paid Lethbridge 130 ps for various items including Swift’s wages for Feb: We have decided to pay him a lira a month each. Easter Sunday. Fine. Went to Presbyterian service at 11 am. conducted by Mr. Drew. It was very nice hearing English girls voices again. There are some people here by name of Scudamore, cousins of those I met at Belgaum [India]. Saw Tod, who is looking very pulled down. Stayed to H.C. [Holy Communion]. The church is some way from our house. Julius and I had tea with Wilson. Fine. Went into the bazaar in the morning & for a walk with Harward in the afternoon. Had tea with him. PC 79 to M. Thick mist this morning. Bought ½ oke cheese 85 ps. Dull & raw. Good mail. [2 post cards and 3 letters from M. – Margaret, his wife. 2 post cards from his mother, a letter from Ethel, and a letter from Robert Berry]. Wrote 80 to M & letter to Frank. Had tea with Genl. Delamain. Good mail. [3 postcards and 3 letters from M, the earliest dated 19th November 1917 and the most recent dated 20th February 1918]. Fine & hot. 83 letter to M. Julius and I walked on upper road for a couple of hours: splendid views: we thought we saw the sea to the west. trees coming into leaf rapidly. Nightingales hard at it singing. Thomas left for general’s house. I have taken his small room. Town flagged to commemorate Sultan’s accession*. Begin my 3rd year of captivity today. Beautiful morning. Leir Bey arrived yesterday, I hope he may have some good news for us. Col. Lethbridge is going to see him this morning. 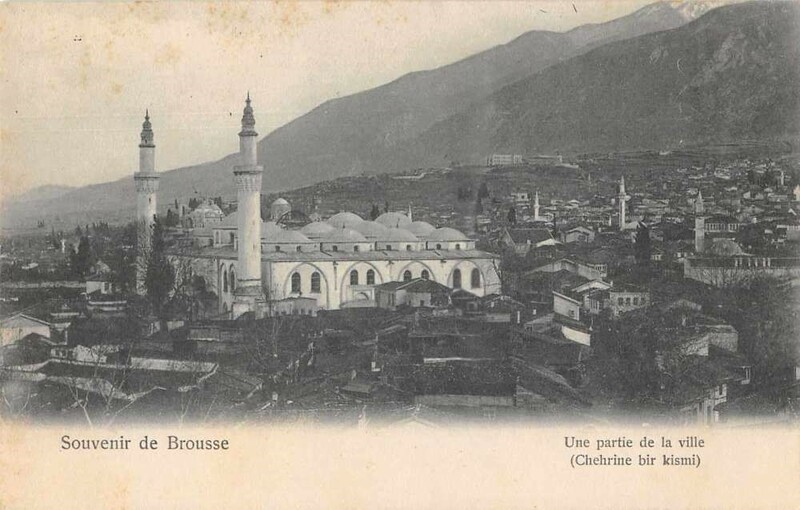 87 post card to M.
Leir Bey had nothing startling to tell us: they had done very little at the conference in Berne from all accounts. Three years today since I left England. Pay for March & April 1500 ps odd. I got actually 14 Liras paid me 92 ps being deducted for bread & 6 for stamps. Had tea with Genl. Hamilton. Julius and I went for a jolly walk on a path along the hillside, it ran amongst vineyards & there were quantities of wild flowers. Lovely weather, very hot. Got into Khaki for the first time this year. Very hot. Letter 35 d/ 12th April from M: 2 books recd. Received a parcel today from Mrs. Bryans – containing jam, potted meat, soup, curry powder, etc: 92 to M. pc. to Mrs. Bryans. Received 3 parcels 2 from F& Mason [Fortnum & Mason of Piccadilly] containing custard powder, milk, and one from M. which had been tampered with, it only had a pair of socks & a pair of pants, tin of cocoa. These parcels must have been sent off about 14 months ago. Received Embassy money – March 7 Liras, April 7 Liras, May 18 Liras. Paid Cpl. Swift 1 Lira wages for May 1918. Very hot again, it was 93° yesterday, followed by a stifling night. Wrote 97 letter to M.
Wrote p.c. 98 to M. asking for a pair of marching boots. Cooler today. Thunderstorm which cooled the air, heavy rain about 8 am. Wrote letters to Mother & Robert Berry & p.c. to Ethel. Embassy Money for June 18 Liras recd., of which Broke Smith took 8 for messing. Rumour that Enver has been shot*. 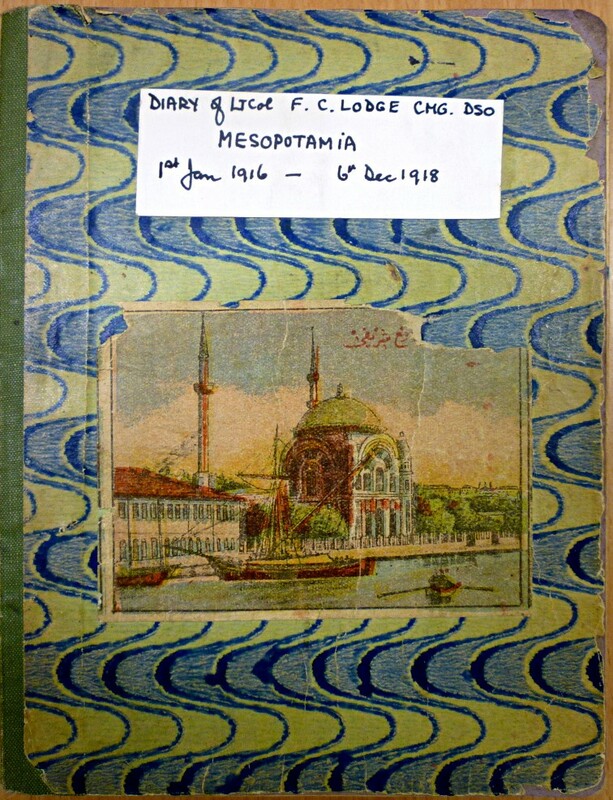 The August and September entries in the diary continue the themes established in June and July: the weather, letters and post cards sent and received, the arrival of parcels, and tea with other officers. P.C. d/ 23 April fr: Mother. We were introduced to the new Commandant this morning. After lunch we received orders that walks were suspended until further orders. No reason given. Presumably on account of escapes from Stamboul, which place is about 8 hours journey from here. So suppose they hold us responsible. The Berne Conference conditions re. p.of w. [prisoners of war] absolutely ignored. N.* did a bunk. Recd. Liras 18 from Embassy. * Lodge gives no further clues to the identity of ‘N’, for obvious reasons. A representative from the Dutch legation arrived yesterday: he came to tea with us. He brought a good number of parcels. His name is Meuten. We went for a very jolly picnic to a small pine wood, about 4 miles out along the upper road. We left at about 9.30 and got back at 5.45 pm. The Scudamores were there, also Meuten of the Dutch Legation to whom we owe a debt of thanks. It was a hot day with a haze, so couldn’t see far. Recd: pay for Sept: yesterday. Genl. Sir C. Mellis, Genl. Evans, Col. Wilson R.E., Capt Halford [R.N. or R.M.] & Freewood RE left this morning for Sangsun [Samsun]. 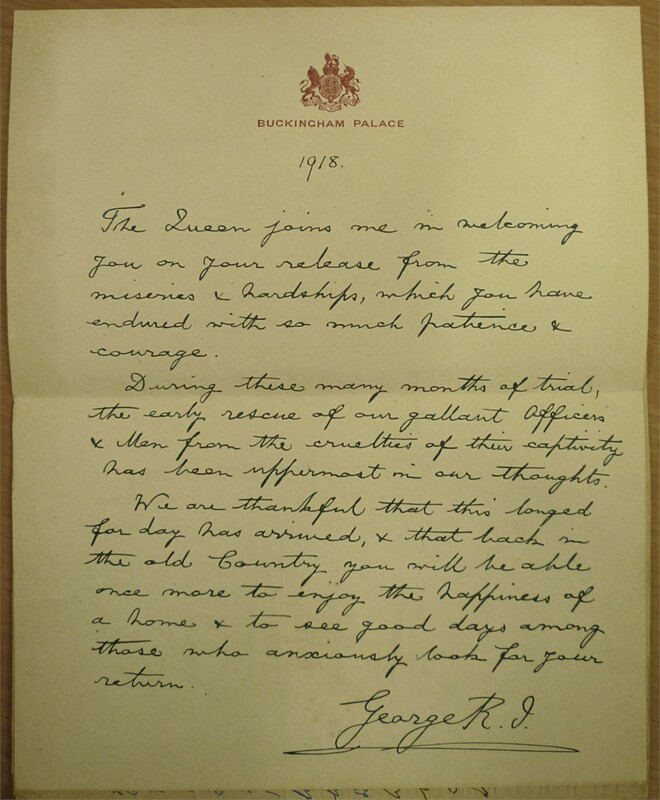 Letter 57 d/ 23 June from M.
* This is the Armistice of Mudros (Mondros) between the Allies and the Ottoman Empire. It was agreed on 30 October, 1918, and came into effect at noon on 1 November, 1918. Julius and I dined with “The Club”. Col Howard, Johnson and McKenna. For the first time since our capture we were allowed out without a posta*. Received 18 Liras from Embassy – also 2000 ps from Cox & Co. No. 603? Heard of the Armistice, everybody including the Turks were delighted. The Turk’s behaviour changed entirely, we were allowed out without postas, in fact we were free. Left Broussa in 3 trains for MUDANIA [Mudanya] on the Sea of Marmara. I left in the last train about 11.45 am. It was a horrible morning rain & very cold. Davie and I drove to the station in an ariba where we found a large crowd of Indian troops, and a few civilians who had come down to see us off. The 2nd train had not started. We arrived at Mudania about 2 pm. Found that there was no boat, so had to hunt for rooms. Having housed the Indian troops (about 1100) in the station buildings, Davie, Julius, Creighton and I got a good room with 4 beds all fairly clean. Heard we leave on 17th about noon. Dined at a restaurant where they gave us a passable dinner for 1 Lira. Cooked our own breakfast in our room. Davie and I walked to a point along the sea road after breakfast, from there we saw a large steamer coming in, she was our transport. When she got closer we saw she was painted in a queer way (camouflaged) this was the first time we had seem this kind of protection. It made an extraordinary difference to the ship’s outline. As it was blowing hard the steamer had to put out again and took shelter under the coastline of the bay. Later a destroyed No. 89 came in with Genl. Wilson & Staff. They landed at the small pier and we had a short chat with them. One of the Staff I had met before Col: Nickerson* V.C. RAMC, in South African days. Orders to embark early tomorrow morning. The destroyer returned to Stamboul during the afternoon. Two minesweepers came in the “Wivenhoe” & Lord Haldane. * William Henry Snyder Nickerson, was born in New Brunswick, Canada, and received the Victoria Cross for gallantry at Wakkerstroom, Transvaal, South Africa on 20 April, 1900. He later became Colonel-in-Chief of the Royal Army Medical Corps. Lovely morning. Began to embark at 8 am. in the two minesweepers. I went off at 10 on the Wivenhoe. The first man I spoke to was a Norfolk man, a Lowestoft smacksman. It was jolly hearing the old talk again. On board 10.30. Out transport is the KATOOMBA, Australian coaster of 11,000 tons. A cabin to myself.. Feeding excellent. Had a splendid hot bath – not before I wanted it. Left about 11.30 anchored for the night off Gallipoli. Off again at 9 am. Genl. Green R.A. broke his leg last night and had to be swung on board. Anchored of Chanak [Çanakkale] at 10.30 & landed stores. French destroyer and one of our monitors here. About lunch time we passed ACHI-BABA [Alçıtepe], SADAL BAR [Sedd el Bahr, Seddülbahir], Kum Kali [Kumkale]. We could see the communication & barbed wire & dugouts, also ruins of forts. The River Clive [S.S. River Clyde], the French battle ship Souffren* and another ship on the rocks, a pathetic sight. A Italian cruiser passed out ahead of us. Mine sweepers busy, heard a mine explode after getting out of the Dardanelles. * Lodge is referring to the wreck of the battleship Bouvet, shelled, mined and sunk in the Dardanelles, 18 March, 1915, with the loss of 660 lives. The Suffren was torpedoed by a German submarine off the coast of Portugal, 26 November, 1916. Arrived off Salonika [Salonica, Θεσσαλονίκη] about 9 am & anchored. The G.O.C. British Forces Genl. Milne & others came on board and inspected us about 2 pm. Col Parr & 2 miss Scudamores came to see us, they are on the Hospital Ship Gurka. We left for Taranto at 5 pm, strong wind. Changed my Turkish money 121 Liras & recd £78.2.11 in English notes. Wet, dull. Wrote to Mrs. Bryans. Arrived at Taranto after breakfast. Our ship, after disembarking us, goes to Egypt. The generals & full colonels left by the Rapide* 5.30 pm. * A fast and comfortable train via Rome and Turin with connections to Paris. A hint of slight envy here from Lodge; he was only a half colonel. Embarked in a lighter 6.30 am. Our camp was a sea of mud. We are housed in a hut with 30 beds, fairly comfy. The mess is a long way off which entails a long walk through a sea of mud. Bought some trousers, Burberry, Belt, cap at the ordnance stores, also a pair of gum boots. Letter No. 94 of Oct 30 from M.
Lethbridge and I dined with Genl. Crowe G.O.C. had a very jolly evening. Another batch of officers came in early on the Kaiser I. Hind* – Cramer Roberts among them. 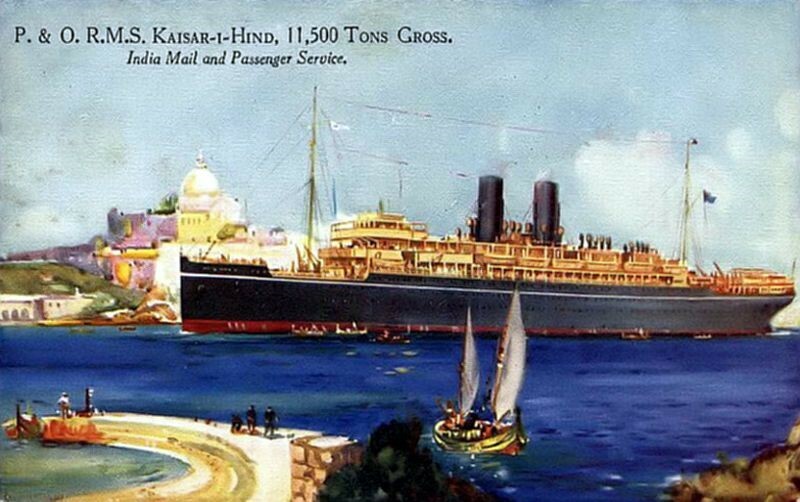 * The Kaiser-i-Hind (Empress of India, in Hindi-Urdu) was a P. & O. liner launched in 1914 for the Bombay to Tilbury run via Suez and Gibraltar. At her fastest she could make the voyage in 18 days. She became a troop transport in 1917, and T.E. Lawrence (Lawrence of Arabia) was one of the officers who took passage in her at the end of the war. My Birthday. Left at 11 am. Lethbridge, Herbert & I in a compartment. Letters from M. 26 Oct 5 Nov:. Made very slow progress. Slept fairly comfortably. Train running along the shores of the Adriatic. Arrived Angona [Ancona] about 8 am, cold, still close to the sea. Passed through snow, beastly cold. Got to Fienza [Faenza] 7 pm. Scot Harden* who was with me at Bickford’s (crammer**) is Comdt. he took me up to camp in his motor, had a good bath and dinner, Italian band played, and a Covent Garden singer performed – back to train 9.30 pm. **A school where pupils where pupils were intensively tutored for an a specific examination, e.g. Sandhurst, Woolwich entrance. Frosty, misty, and thoroughly beastly. Got to Parma at noon. Passed through Mt. Cenis tunnel [Mont Cenis Tunnel / Fréjus Rail Tunnel between Italy and France] 9 am took 27 minutes. Déjeuner at the Hotel Savoy Modana [Modane]. Left again at 11 am. Got to Lyon [Lyons] B_____ about 8.30 and on to St Germain’s where we stayed the night. Dull morning, passed Versailles at 8 am. Many indications of fighting just before we reached Amiens. A long tedious journey from here to Calais where we arrived at 2 am. Rotten night. Staying at Terminus Hotel – sent a wire to Talbot Square. Margaret and I left Woodmansterne on Saturday morning by motor on the 8th May, 1915 for Liverpool Street Stn., where Ethel, Oliver & Cyril met us. The special (P&O) left about 10.30, Oliver & Cyril came down to Tilbury with me, but were not allowed aboard. I shared a cabin on the P&O Arabia with a major Rumbold of the East Surrey’s he was going out to be attached to the Norf. Regt. 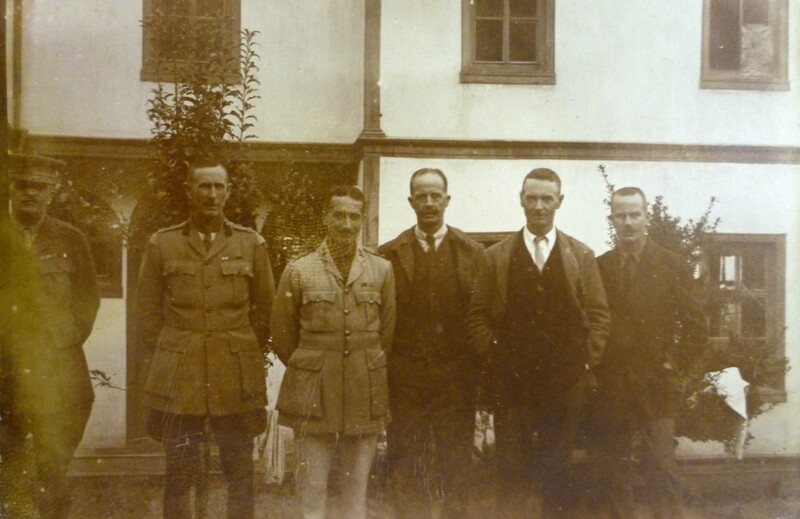 On board were about 26 officers going out to Mesopotamia including Day, Boosey, Russell, Cooke, Ritchie – the last 3 from our 3rd Bt., all were going out to join my Battn. the 2nd Norfolk Regiment. There were also on board a number of colonial nursing sisters going to Malta which was then a receiving station for wounded from Galipoli [sic]. Had an eventful start, as a German submarine had a go at us somewhere off the Scilly Islands, but missed us. … No further incidents during the voyage. From Port Said eastwards we were able to have lights which made it much more cheerful. Called in at Aden but did not go ashore. Arrived at Bombay early on the 28th May, 1915. Nobody seemed to expect us and, after reporting our arrival took some rooms at the Taj Mahal [Hotel]. Day and I went to St. George’s hospital and saw Marshall who had been badly knocked about at Shaiba and Farebrother hit in the spine – he died soon after arrival in England. Day and I went to see Marshall and Frere off in hospital ship to England. Rumbold came with me to Colaba Hospl. to see if any of our wounded were there – only 6 left, the others have either been sent home or to Poona & Belgaum. … The hotel was filled today with Australian doctors & nurses & staff for 1000 beds; they came in P&O Mooltan, they go to France I think. 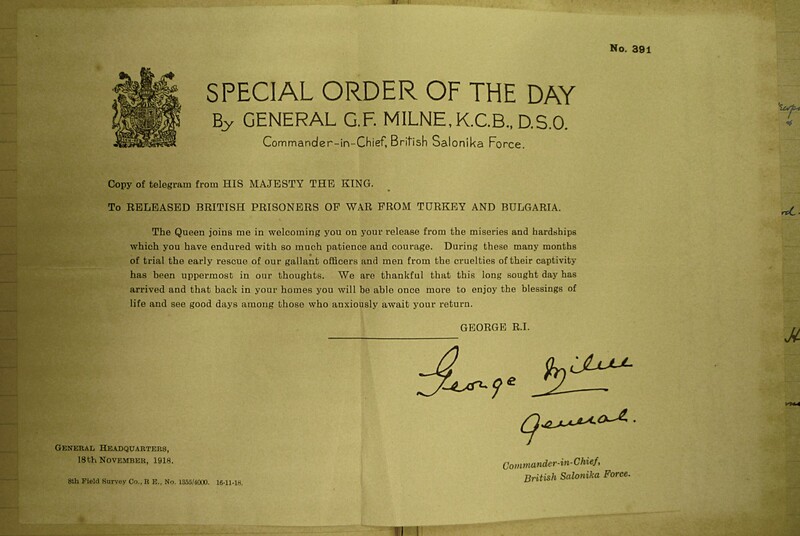 Got our orders for Persian Gulf – Day & I drove to docks about 8.30 a.m. 6th June. We embarked all the officers who came with me and few details, returning escorts of Turkish prisoners, at 9 a.m. on board B.I. [British India Steam Navigation Co,] Longwa: [I] am O.C. troops.